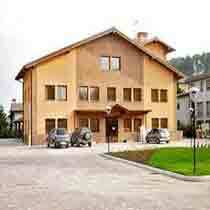 There are two cities which are convenient to Malpensa airport located on Lake Maggiore. Most people staying on Lago Maggiore stay on the west side of the lake because it’s the easier to get to the airport from there. Closest is the village of Stresa which is 20km from the airport and offers a good choice of hotels ranging from one star budget accommodation to luxury villas. First and foremost Stresa is a tourist town with a good range of shops selling local Deruta pottery. A quieter and less touristy option is Arona which is 40km from Malpensa Airport and again offers a good range of hotels to choose from. Lago d’Orta is situated to the west of the Maggiore Lake (between the Mount Mottarone) in the province of Novara. It is also called Lago Cusio and is more charming than Stresa, or you can travel a few more kilometres to Piemonte which is a gastronomes delight with its local chocolate, cheese and Italian risotto towns including Novara and Vercelii. This modern hotel with a brightly coloured façade overlooks Ticino Park in Somma Lombardo which is close to the Exhibition grounds just 5km from Milan Malpensa Airport, 40km from Milan city centre and 8lm from Lake Maggiore. They offer a complimentary airport shuttle service. 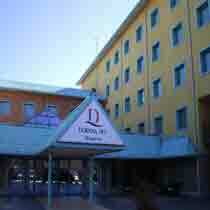 Domina Inn Malpensa has 143 private guest rooms and has good amenities which include a restaurant, snack bar and lounge. 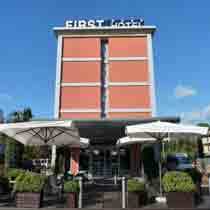 The First Hotel is a modern hotel located in the town of Somma Lombardo which is situated between Milan and Stresa, mid way between terminals 1 and 2 just 1km from Milan Malpensa Airport. It offers a private shuttle bus service between 04:30 and 01:00. It has 58 soundproofed guest rooms which are well equipped with Wi-Fi internet connection, air conditioning, a minibar, satellite flat screen television, pay-per-view movies, direct dial telephone, a working desk and lamp. It is an ideal place to stay for travellers who like to combine their business and leisure travel requirements offering a restaurant, lobby bar and two meeting rooms. The contemporary three storey Crowne Plaza Hotel is located in Somma Lombardo, between Terminal One and Two of Milan Malpensa Airport, just 40km from the city centre. There is complimentary shuttle running to/from Terminal 1 on a scheduled basis and Terminal 2 on request. Or the airport offers a 24hr free shuttle service between the two Terminals with a bus stop just 500 metres from the hotel. The hotel was fully refurbished in 2005 and offers 133 single and double bedded guest rooms with satellite television, minibars, and direct-dial phones and bathrooms with bathrobes, bidets, and hair dryers, as well as parking for 100 cars, a restaurant, bar/lounge and health club. 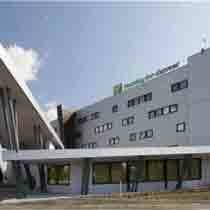 The Holiday Inn Express Milan-Malpensa Airport is just 500 metres from Milan Malpensa International Airport. It is a modern hotel with 124 contemporary and comfortable soundproofed bedrooms spread over five floors, all well equipped and offering WiFi internet connection. The hotel offers a complimentary shuttle service on a scheduled basis to/from Terminal 1, extensive parking facilities, free Continental breakfast and a meeting room which can accommodate up to 40 people. The modern Orange Motel stands in parkland in the Vergiate area just 2km from the town centre, 2km from Lake Maggiore and 12 kilometres from the town of Arona. Vergiate railway station is two kilometres from the hotel. Milan Malpensa Airport is about a 20 minute drive away (20 km). The two storey Orange Motel is a modern building situated in parkland. It offers just 29 guest rooms which are well equipped with satellite TV, DVD players, internet access, a minibar and in room safe. The bathrooms have bidets and offer complimentary toiletries. Other hotel amenities include a lounge bar, buffet breakfast, sauna, laundry and dry cleaning services and secure complimentary parking.